Each type of user has features helping him to collaborate with other users. To maintain & track an aircraft, you can have from 50 to 2000 components to track by date, flight hours, cycles to maintain the aircraft safety. Skyzen allows you to track all these components and select automatically the operations to perform at each maintenance. The regulatory authorities give the responsibility of Airworthiness Management to Operators or CAMO. Miss a new technical document appliance can cost you an expensive fines. Skyzen gives you a complete history of your aircraft maintenance performed on your aircraft. You can provide these data to potentials buyers. The result is higher aircraft value and an aircraft easier to sell. Skyzen provides you dashboards with hours, days, cycles lefts for each of your aircrafts and an estimated date for the next maintenance. In this way, you can anticipate the next inspections with the MRO and the operator. 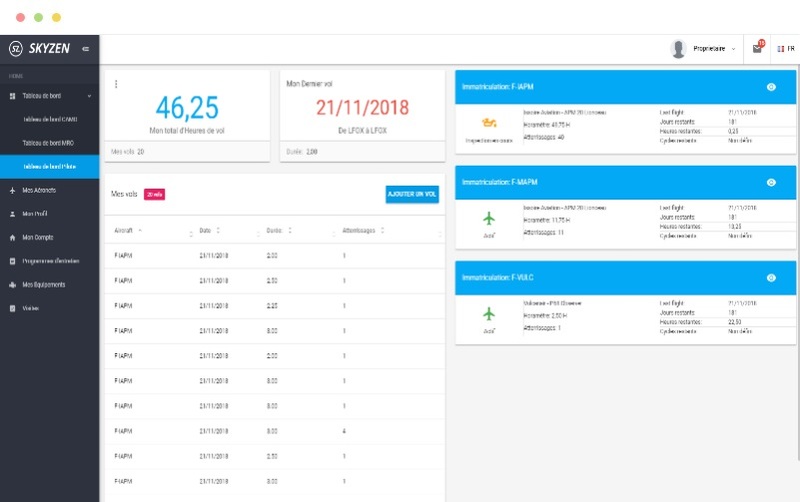 Skyzen provides you an interface to your owners a operators to submit their flight hours or they can upload all their flights from a csv file. Skyzen provides you the list of operations to perform on the aircraft. Your mechanics just have to complete the operations perform on a tablet. Skyzen also generate all the inspections documents, you just have to sign them and upload them at the end of the inspection. 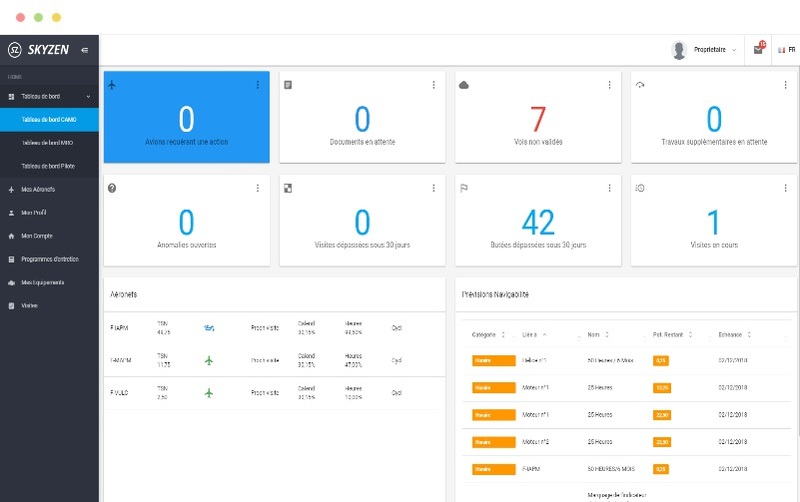 Skyzen keep logs on all the inspections you perform in your organization by archiving all the inspection documents on Skyzen. All these files are saved in geo redundant servers and backup multiple times per day. Create accounts for your pilotes to let them enter their flight data directly from the cockpit on our mobile app. 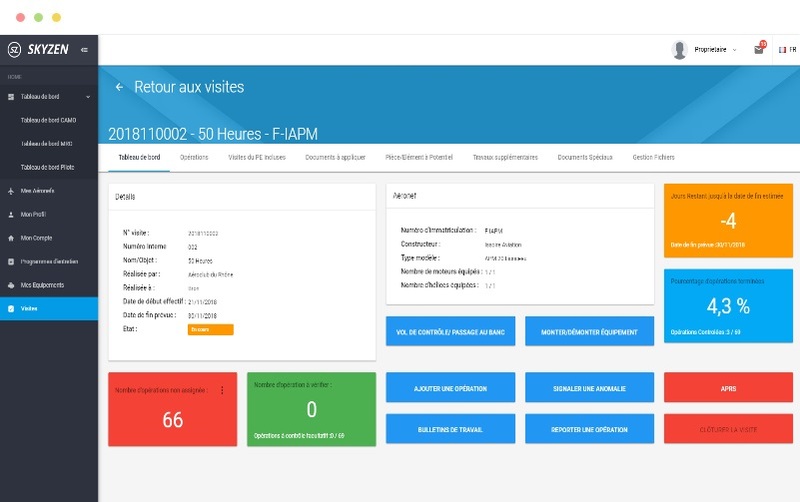 Suivez la navigabilité de chacun de vos aéronefs en temps réel. Ajoutez les nouveaux documents techniques (CN/AD/SB, …), les éléments à vie limite, les travaux supplémentaires. Gérez des programmes d’entretiens propre à chaque équipement. Keep your inspection’s history online and check it when you need. The inspections are linked to the aircraft during it whole life even if the owner or the maintenance workshop change. The limits and the modifications on the aircraft and the equipments is traced in a blockchain in order to keep an history. You can generate your inspection’s documents such as CRS ou weighting reports to print them. Then, you can upload your documents on Skyzen. These documents can be downloaded when you need its. Define horizons for each type of limit (calendar, time, cyclic) to receive notifications with all the limits included in these horizons when you add a new flight. 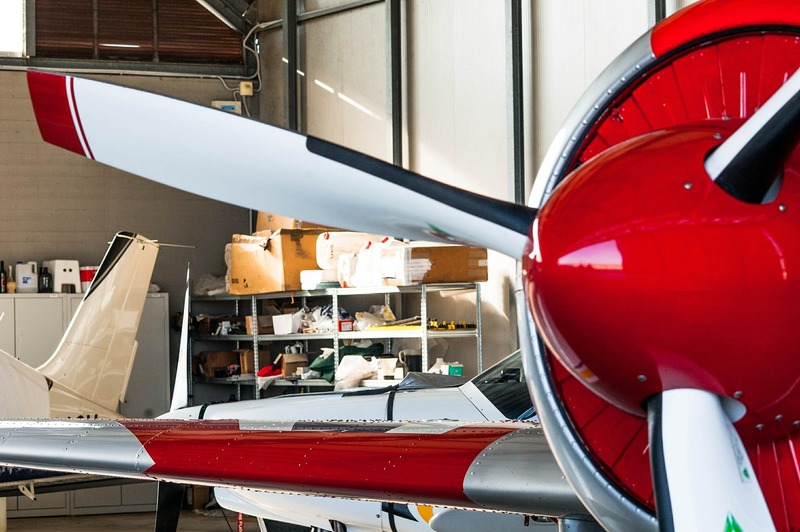 Manage your inspections, mechanics, aircraft or pilots on multiple sites. Select the site where you want to perform each inspection. Skyzen is available in English and French. We can add easily a new language if required. Skyzen provides you a real-time overview on the activity of your workshops and the airworthiness of your fleet. Skznd less time on administrative tasks and focus on essential.